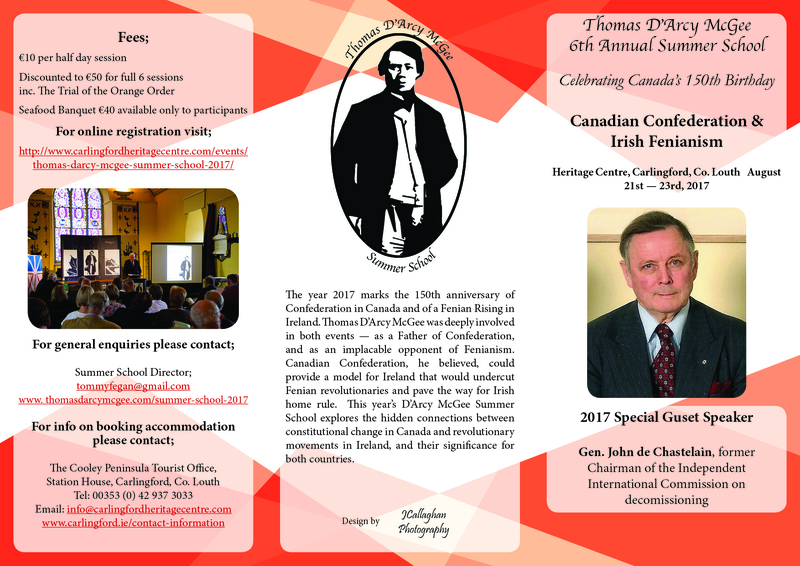 The Thomas D’Arcy McGee Summer School in Carlingford, 21-23 Aug. helps Canada celebrate its 150th birthday. 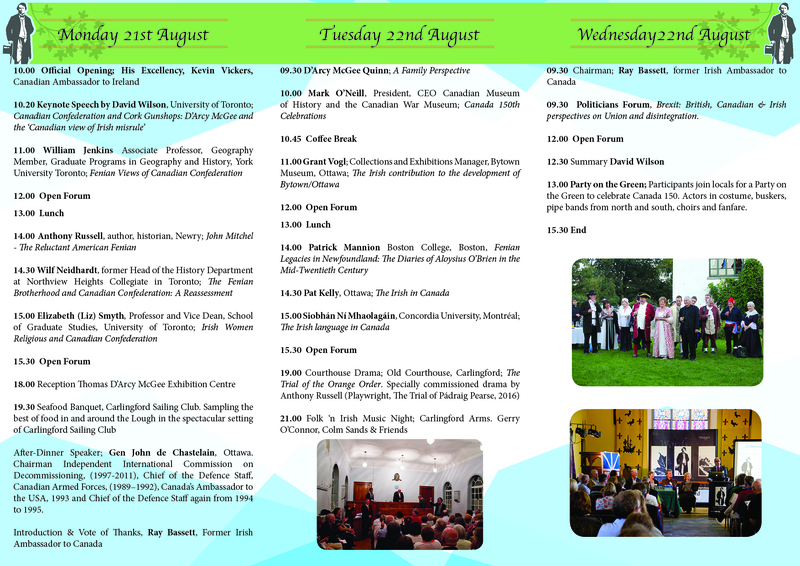 Canadian Confederation & Irish Fenianism is the theme of the 6th annual Summer School dedicated to D’Arcy McGee, whose inspirational speeches played a key role in the establishment of the Canadian confederation in 1867. 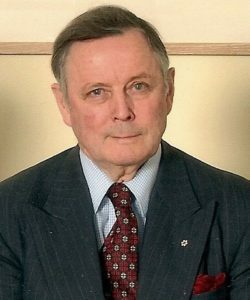 And this year’s special guest, General John de Chastelain, former Chairman of the Independent International Commission on Decommissioning, was one of the key players in the confidence-building process that led to the Good Friday Agreement in 1998. The year 2017 marks the 150th anniversary of Confederation in Canada and of a Fenian Rising in Ireland. Thomas D’Arcy McGee was deeply involved in both events — as a Father of Confederation, and as an implacable opponent of Fenianism. “The best argument we can make here for Ireland,” he said on St Patrick’s Day 1868, three weeks before his assassination, “is to enable friendly observers at home to say: ‘See how well Irishmen get on together in Canada. There they have equal civil and religious rights; there they cheerfully enjoy just laws, and are ready to die for the rights they enjoy, and the country that is so governed.’ Let us put that into the hands of the friends of Ireland at home, and it will be worth all the revolvers that were stolen from a Cork gunshop.” He might have added that those revolvers had been stolen by William Mackey Lomasney, a Fenian who had been raised in Toronto. Leading academics, politicians and community activists from Canada and Ireland will provide an informative, engaging and enjoyable 3-day birthday party. Early booking is advisable. Following the runaway success of The Trial of Pádraig Pearse (it has played to packed audiences in 18 locations in Canada and Ireland since last year’s Summer School), which was commissioned for the 2016 Summer School, playwright Anthony Russell has accepted a commission to write a follow-up, entitled The Trial of the Orange Order. Gerry O’Connor, Colum Sands and friends will provide the music, which is always popular with visitors and locals.